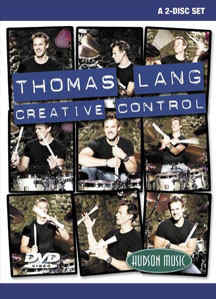 After first seeing Thomas Lang perform at the Modern Drummer Festival 2002, I was looking forward to reviewing his instructional DVD. The two-disc set contains over five hours of material. After you sample the video previews that follow, come on back and we'll take an in-depth look the DVD. After opening the disc with an energetic tune called "Dog," Thomas explains his approach to practice, which is based on what he calls "control mechanisms." The first chapter begins with Hand Warm ups and moves into alternating linear single strokes between the hands and feet (learning to play the feet both on and off the beat). He then demonstrates the use of alternating singles in a hi-hat solo during which he uses two hi-hats, one on his right and one on his left foot. Thomas feels that by always practicing hands and feet together it not only shortens your practice time but allows you to build the necessary coordination between the hands and feet faster than practicing hands or feet alone would accomplish. And many more combinations all designed so that you are practicing your hands and feet together, which allows you to build your coordination, technique, and endurance at the same time. Thomas begins by explaining why he uses the technique of accenting the second stroke of each double stroke. He then applies double strokes to the drumset utilizing exercises that have helped him develop his own chops . The chapter closes with two examples in a musical context. Thomas suggests that you learn to sing patterns as you play them and demonstrates his method of combining singles and doubles in patterns that require advanced coordination. This chapter closes with Thomas playing to a music track, "Ben's Repellant." Thomas discusses his approach to dynamic foot technique, in which he uses heel up and heel down styles. He then covers his approach to Multi-Pedal Orchestrations (MPOs) in considerable detail before applying them on a tune titled "Angel." "Think of practicing as physical training," advises Thomas while warning drummers not to "display your fitness unless it is necessary for executing the drum part. Most of the workouts you'll need to do have absolutely nothing to do with music." He warns us not to fall prey to one of the most common mistakes drummers make, "overplaying while under listening." Thomas demonstrates the various patterns that he uses to develop his ability to move around the drumset swiftly and accurately including cross sticking and the orchestration of rudiments around the set using repetitive phrases, which Thomas prefers over random ones. Thomas demonstrates the technique required to play the Sonor Giant Step Twin FX pedal, which is actually two pedals in one, going into depth as he shows various ways of incorporating the Twin FX pedal into drum grooves. Thomas demonstrates the visual stick tricks he employs including the Fake Twirl, Real Twirl, Off Beat Throw, Back Throw. Combinations, Stick on Sticks, Stick on Sticks Backsticking and Sticks on Skins Backsticking. Broken Doubles on Cymbals and Body Motions are also covered. Thomas' applications of these tricks to various drumset grooves and fills is extremely practical and useful. The final chapter features Thomas in an impressive display of solo virtuosity using nearly all of the patterns he covered throughout the DVD. While you're watching the above eight chapters on the DVD, a round icon will periodically appear in the corner of your screen. Press "enter" on your remote and you get instant access additional information after which, you'll be taken back to the original chapter. Very cool. Included are audio files in ACID (PC) and REX (MAC) formats, which let you loop any of the exercises or change tempo without affecting the pitch. In addition, there are 94 printable PDF file transcriptions of Thomas' performances and over 100 exercises. Now that's using the DVD format to the max! If you are looking for patterns, exercises, and ideas to expand your creativity in groove and solo work, you will find plenty here. Thomas does a great job of explaining and demonstrating the patterns he uses to develop his own chops. The only thing not covered is the detailed "how-to" for developing the technique required to play at the speeds Thomas demonstates. But, if you already possess decent speed, I highly recommend this DVD as it will provide you with more than enough exercises to increase your coordination, control, and endurance.